As we all know Raspberry Pi is a wonderful Developing platform based on ARM microprocessor. With its high computational power and development options it can work out wonders in hands of electronics hobbyists or students. 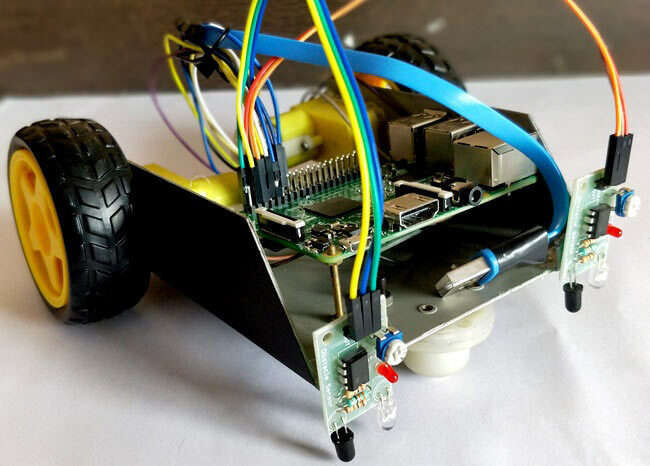 To learn more about a Raspberry Pi and how it works, let us try building a Line Follower Robot using Raspberry Pi. Line Follower Robot is able to track a line with the help of an IR sensor. This sensor has a IR Transmitter and IR receiver. The IR transmitter (IR LED) transmits the light and the Receiver (Photodiode) waits for the transmitted light to return back. An IR light will return back only if it is reflect by a surface. Whereas, all surfaces do not reflect an IR light, only white the colour surface can completely reflect them and black colour surface will completely observe them as shown in the figure below. Learn more about IR sensor module here. Now we will use two IR sensors to check if the robot is in track with the line and two motors to correct the robot if its moves out of the track. These motors require high current and should be bi-directional; hence we use a motor driver module like L293D. We will also need a computational device like Raspberry Pi to instruct the motors based on the values from the IR sensor. A simplified block diagram of the same is shown below. If left sensor comes on black line then the PI instructs the robot to turn left by rotating the right wheel alone. If right sensor comes on black line then the PI instructs the robot to turn right by rotating the left wheel alone. This way the Robot will be able to follow the line without getting outside the track. Now let us see how the circuit and Code looks like. As you can see the circuit involves two IR sensor and a pair of motors connected to the Raspberry pi. The complete circuit is powered by a Mobile Power bank (represented by AAA battery in the circuit above). As shown in the picture the top left corner pin of the PI is the +5V pin, we use this +5V pin to power the IR sensors as shown in the circuit diagram (red wired). Then we connect the ground pins to the ground of the IR sensor and Motor Driver module using black wire. The yellow wire is used to connect the output pin of the sensor 1 and 2 to the GPIO pins and 3 respectively. Once you are done with your assembly and connections your robot should look something like this. We are setting 6 pins as input/output pins. The first two pins are the input pins to read the IR sensor. The next four are the output pins out of which first two is used to control the right motor and the next two for the left motor. The IR sensor outputs “True” if it is over a white surface. So as long as both the sensor says True we can move forward. Upload the python code for line follower to your Raspberry Pi and run it. We need a portable power supply, a power bank in this case becomes handy hence I have used the same. The one that I am using comes with two USB ports so I have used to power the PI and other to Power Motor Driver as shown in the picture below. Now all that you have to do is set up your own black colour track and release your bot over it. I have used a black colour Insulation tape to create the track you can use any black colour material, but make sure your ground colour is not dark. The complete working of the bot can be found at the video given below. Hope you understood the project and enjoyed building one. If you have any questions post them on the comment section below. How thin do you think you could make the line and still be able to accurately track the line? cant we just use ir sensor instead of whole module? I bought a L293D Arduino motor shield. Can it be implemented in this project?